As a full-time coach, one of the exercises I do with my clients is creating an I Am Amazing List—a list of all the reasons their amazing! It’s hugely beneficial because our minds inundate us with negative and disempowering thoughts. The solution is to rebel against those kinds of thoughts by flooding our minds with positive ones. What are the most amazing things you’ve ever done, achieved, or created in your life? Begin today to change how you think about yourself by making a list. 1. Reminding yourself of your amazingness increases your confidence. Confidence is the attitude and the energy that moves you toward your goals. It transforms your thoughts into actions. And it actually comes from taking action. See, it’s in your willingness to take risks, to struggle, to fail, and then to eventually master something that you develop confidence, which like faith, success, and love—is an action word. But when you’re not confident enough to take action, you can encourage yourself by writing an I Am Amazing List and referring back to it. 2. It conditions your mind to look for the good rather than the bad. Whatever you focus on in life, you will find. Whatever you search for in the world or in yourself will show up. The reality you create is the result of what you’ve been focusing on. What you choose to focus on becomes your destiny. 3. It helps you feel better, which is the underlying purpose behind everything you want to achieve or experience in life. Everything you want in life is because you believe it will make you feel better. The secret to life, then, is feeling better now—in this place and time. 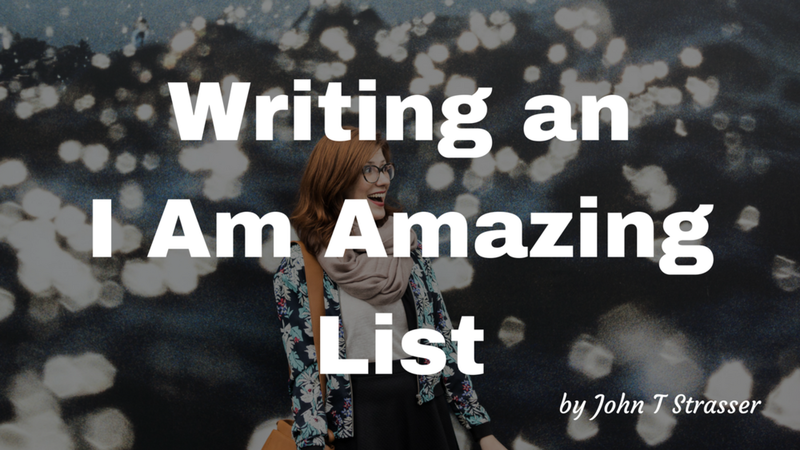 And deciding to make an I Am Amazing List will do just that.